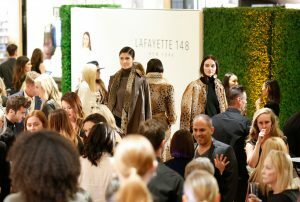 For many years a fixture on the East Coast and in popup boutiques at noted department stores, fashionable clothier Lafayette 148 has opened a flagship store inside South Coast Plaza. At the opening event on Thursday, Nov. 1, Lafayette 148 Creative Director Emily Smith and CEO and Co-Founder Deirdre Quinn, along with a host committee from Girls Inc., welcomed an array of VIPs to an exclusive evening of fashion and philanthropy that marked the opening of Lafayette 148. Guests were treated to a fashion presentation featuring looks from Lafayette 148’s Fall and Holiday collections. 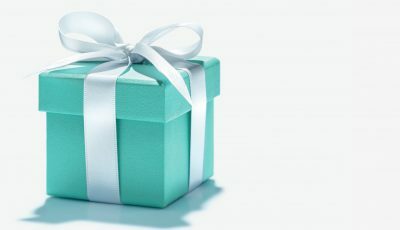 The event celebrated the “Art of Giving,” with 10 percent of each sale donated to Girls Inc. of Orange County that night, and daily through December 1. 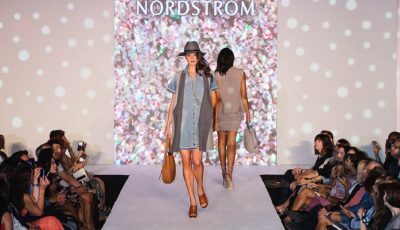 Themed around “Art of the Occasion,” the fashion show featured festive pieces suited for desk-to-dinner dressing and holiday gatherings. Highlights included day-to-night looks in a wintry palette of white and gold, luxe coats in cashmere, calf hair and leather, as well as an editor’s favorite evening suit in scarlet satin. We had an opportunity to chat with Lafayette 148 Creative Director Emily Smith prior to the opening. She talked about the versatility of the Lafayette 148 designs. Laura wanted to know if there were any trends or colors planned for winter and spring. Christopher noted that some of the designs on the Lafayette 148 website had a Picasso-esque sensibility to them, to which Smith explained that she went to art school and studied art history, so that artistic approach is often revealed in her approach to clothing. 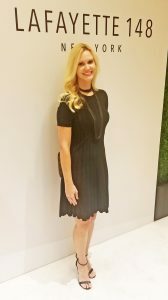 After chatting with Emily, Laura had the unique opportunity to shop with the Creative Director herself at the South Coast Plaza flagship store, located on the first level, between the Macy’s Men’s Store and Saks 5th Avenue. Called “Fall at Fallingwater,” the Lafayette 148’s Fall Collection was inspired by Frank Lloyd Wright’s Fallingwater home in Mill Run, Pennsylvania. The clothing symbolizes the home’s iconic architecture and natural foundation, and provided the ideal setting for the season’s catalogue photo shoot. “Like Wright, we celebrate the harmony between art and its environment. Our new West Coast flagship brings this to life with a mix of our modern design and California’s natural sensibility,” explained Smith. Laura tried on nine different looks, including a wide leg black pant paired with a cream blouse with a wrap tie, a leopard print dress with an askew hemline, and a black sequins pullover with a skinny black satin pant. With each look Laura tried on, Emily gave styling suggestions for accessories and shoes, ranging from options in the store to ideas to use from Laura’s own closet at home. 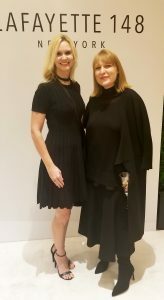 Laura noted that while not everyone has the chance to shop with a fashion designer, each Lafayette 148 store does offer a personal shopping experience. Walk-ins are welcome, but shoppers are encouraged to call ahead to schedule an appointment. They also offer in-store, complimentary alterations. To schedule an appointment at the South Coast Plaza flagship store call (714) 868-3131. Or shop online at Lafayette148ny.com.